Climate change might be changing the oceans’ color in the future, new research reveals. Significant changes to global phytoplankton populations and their distributions in the coming decades will intensify the oceans’ blues and greens, new research from MIT suggests. These changes should be observable from orbit, the authors add, meaning satellites could be used as an early warning system against wide-scale changes in marine ecosystems. The team reports developing a global model which simulates the growth rate and interactions between different species of phytoplankton (bacteria and single-cell algae). This model allowed them to estimate how the mix of phytoplankton species will evolve in various locations throughout the world as temperatures rise in the future. 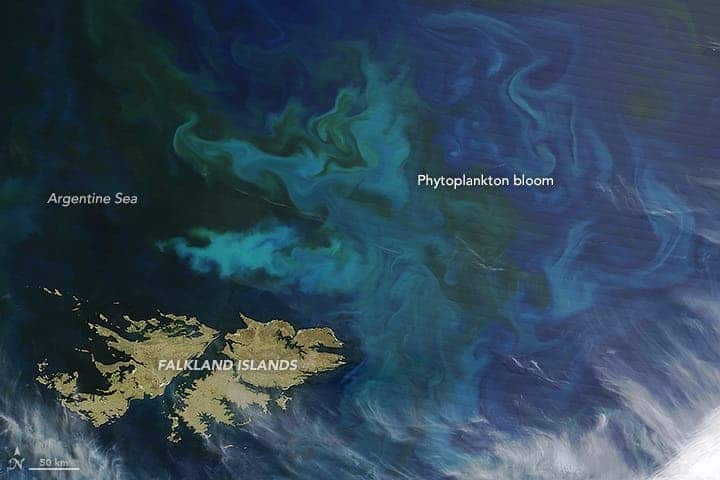 The team also simulated how phytoplankton absorb and reflect light, and estimates a perceivable change in the ocean’s color as global warming affects the makeup of phytoplankton communities. 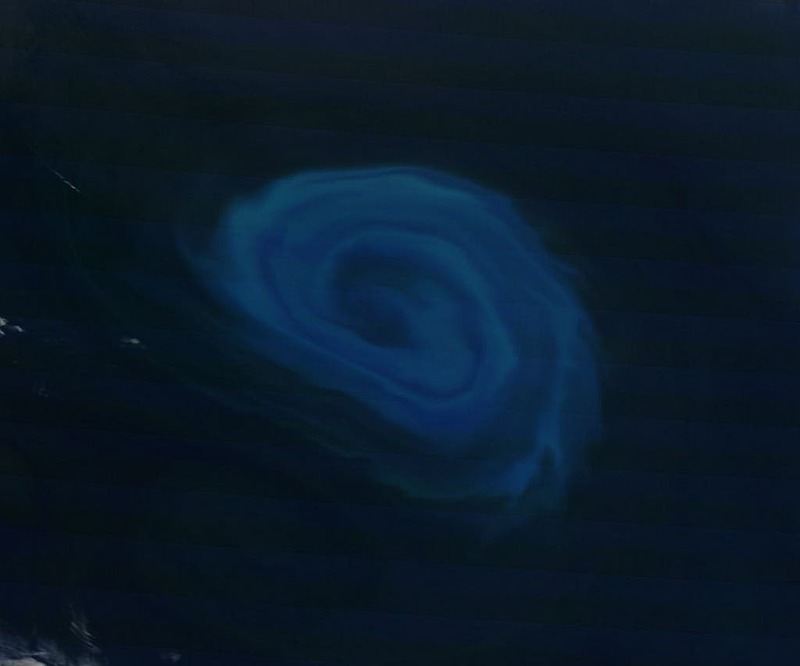 An example of how phytoplankton can change ocean color. Picture taken off the coast of the Falkland Islands, 2015. Image credits NASA via Wikimedia. The team allowed their model to simulate conditions up to the end of the present century. By the year 2100, they report, over 50% of the world’s oceans will suffer shifts in color due to climate change. Areas that are predominantly blue, such as the subtropics, will become even more blue as phytoplankton — and all the life it supports, which is virtually all life in the area — dwindle. Greener areas, such as those near the poles today, may turn deeper shades of green as warmer temperatures cause blooms of phytoplankton. Ocean color is formed by the interaction between light, water, and whatever is in the water. H2O itself absorbs most of the light spectrum except for part of the blue wavelengths — which get reflected. That’s why relatively-pure oceans or other bodies of water look blue from space. Organisms in the water tend to change this overall color, as they absorb and reflect different wavelenghts of light. Based on this principle, scientists have been using satellites to measure ocean color since the late 1990s. This data can be used to estimate the amount of chlorophyll in a given ocean region, and by extension the amount of phytoplankton. But Dutkiewicz says chlorophyll estimates don’t necessarily reflect climate change — significant swings in chlorophyll could come down to global warming, but they could also be due to “natural variability” due to natural phenomena such as weather. A particularly-swirly Phytoplankton bloom off the coast of South Africa, near where the South Atlantic meets the Southern Indian Ocean. Image credits Flickr / NASA Goddard Space Flight Center. So the team looked to satellite measurements of reflected light, instead. They started with a computer model used previously to predict phytoplankton changes caused by rising temperatures and ocean acidification. This model takes information about phytoplankton, such as feeding and growth patterns, and incorporates it into a physical model that simulates the ocean’s currents and mixing. However, this time they also gave the model the ability to estimate the specific wavelengths of light absorbed and reflected by the ocean, depending on the amount and type of organisms in a given region. The model’s results were compared to actual measurements of ocean-reflected light taken in the past. The two data sets matched well enough to suggest the model can be used as an accurate predictor of ocean color in the future, the authors write. So the team allowed the model to work after setting mean temperatures to rise by up to 3 degrees Celsius up to 2100. This increase is consistent with most estimates of how climate conditions will fluctuate under a business-as-usual scenario. Blue and green wavelengths responded the fastest under this scenario, the researchers report. They add that these wavelengths also show a significant shift, due specifically to climate change, much earlier than previously predicted climate-change-induced changes in chlorophyll by 2055. According to their model, climate change is already changing the makeup of phytoplankton, and by extension, the color of the oceans. 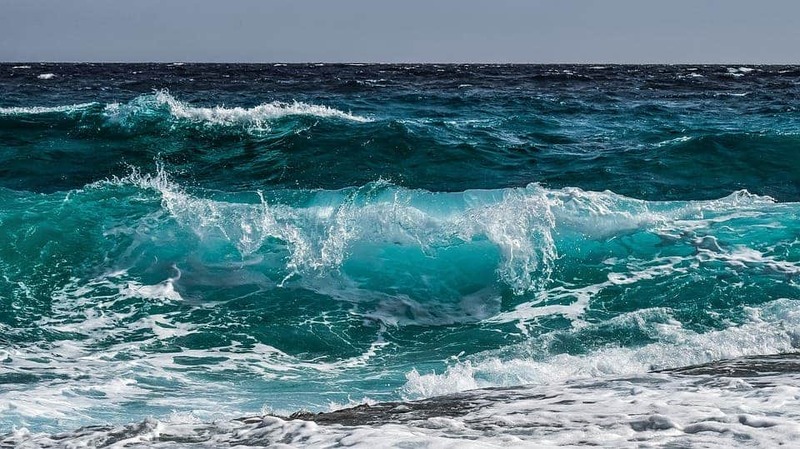 By the end of the century, they add, we will see “a noticeable difference in the color of 50 percent of the ocean”, with “potentially quite serious” implications. Different hues of chlorophyll absorb different wavelenghts of light, and such climate-induced changes could have a dramatic impact on the ocean’s food webs, the team concludes. The paper “Ocean colour signature of climate change” has been published in the journal Nature Communications.